610 min. HBO. Directors: Greg Mottola, Joshua Marston, Jeremy Podeswa, Alex Graves, Alan Poul, Daniel Minahan, Lesli Linka Glatter. Cast: Jeff Daniels, Emily Mortimer, John Gallagher Jr., Alison Pill, Thomas Sadoski, Dev Patel, Olivia Munn, Sam Waterston, Jane Fonda, Chris Messina, Terry Crews, David Harbour, Hope Davis, Paul Schneider, David Krumholtz, Stephen McKinley Henderson, Jon Tenney, Natalie Morales, Marshall Bell, Philip Baker Hall, Kathryn Hahn, Adam Arkin, Matt Long. The term "hate-watching" went viral in 2012, in no small part due to Aaron Sorkin's love-it-and-hate-it HBO series The Newsroom. The Newsroom gives Sorkin an opportunity to recycle and rework motifs and characters from his earlier TV series that, at least in commercial terms, failed: Sports Night and Studio 60 on the Sunset Strip. Both of those series concerned high-functioning creative types tilting at corporate windmills, protecting their warm-heart art (and their moral righteousness) from cold-hands commerce. Along with the hit NBC drama The West Wing, Sorkin's series have given him soapboxes for pet causes, both political and social. And so we arrive at The Newsroom and Sorkin's latest surrogate Will McAvoy (a perfectly cast Jeff Daniels). A Bizarro-world Keith Olbermann, McAvoy has been called the Jay Leno of news anchors, unwilling to declare political opinions that might alienate any segment of the audience (turns out, he's a Republican frustrated by the hijacking of his party by the far right). When McAvoy snaps in a public forum and monologues about how America has lost its way (hello, Paddy Chayefsky), it's not long before his weeknightly cable news hour reboots as what the staff calls "News Night 2.0": a program that will show allegiance to facts above all, hold guests accountable to them, and enable no false equivalency for unsupportable views. The Dulcinea muse for this Quixotic quest—and oh, yes, Sorkin makes that allusion, repeatedly—is MacKenzie McHale (Emily Mortimer), the new executive producer who also happens to have broken, in recent memory, Will's heart. The secret mastermind behind reteaming grumpy Will and can-do MacKenzie, boozy old-school newsman Charlie Skinner (Sam Waterston) runs the news division of ACN (Atlantis Cable Network), a subsidiary of Atlantis World Media. In its 2.0 incarnation, News Night also employs a bevy of hungry young talent ripe for romantic-comedy entanglements. There's senior producer Jim Harper (Tony winner John Gallagher Jr.), newly named—and not especially qualified—associate producer Maggie Jordan (Alison Pill), in-house blogger Neal Sampat (Dev Patel), and economics reporter Sloan Sabbith (Olivia Munn). Always hovering nearby is News Night's former executive producer Don Keefer (Thomas Sadoski), consulting on News Night as he executive produces a less ambitious news hour for anchor Elliot Hirsch (David Harbour). Don is also Maggie's wrong-for-her boyfriend, the obstacle to right-for-her Jim. With these pieces in place, Sorkin serves up weekly chunks of Capra-corn: heroic idealism, wish fulfillment, comedy, drama, and romance. I'm not gonna lie: I'm a sucker for Sorkin. And there's something compulsive about The Newsroom that makes it apppointment television, even if only for train-wreck "hate-watching." Certainly this has something to do with Sorkin's own compulsiveness, a sword he lives and dies by. Sorkin's Old Hollywood rat-a-tat-tat dialogue is pretty darn entertaining, but he's been fairly accused of characters who all talk with the same voice (with a degree in Musical Theatre, Sorkin can't resist giving all of his characters a fluency in it, dropping allusions in The Newsroom's ten episodes to Man of La Mancha, Gypsy, Brigadoon, West Side Story, Annie Get Your Gun, Oklahoma!, Evita, Spider-Man: Turn Off the Dark, and Camelot). He shares teleplay credit only once in Season One, so the axes that grind are all Sorkin's. It's easy for critics to be petty about that, but even when Sorkin's being personally defensive through his characters (decrying internet commenters, and celebrity-gossip journalism, both of which he's loudly run afoul of), he's rarely wrong to be righteously upset as he plans Will's "mission to civilize." Where it gets a bit unseemly is the arrogant tone taken by Sorkin's characters and their creator. Variations on the word "elite" keep cropping up, and it ultimately becomes a badge of pride, buttoning a McAvoy rant with "We are the media elite." Okay, and he and his staff take that responsibility very seriously, but it's needlessly dismissive to suggest that the only good reporter is a News Night reporter (except the dead ones in the opening credits), and one can only prove oneself by walking through the News Night fire. One episode revolves around a young internet-sourced Egyptian freelancer: he becomes part of the "media elite" when Will says so (when the lad is needed, to cover the Arab spring). Maggie may as well have pulled the sword from the stone to get her job handed to her, but she proves she deserves it, while Hirsch earns his bona fides by being beaten up in Tahrir Square while reporting for Will and MacKenzie. If Sorkin's own attitude, reflected in Will, is "don't test me," at least the show acknowledges the hero's interpersonal problems and dubious physical and mental health (a therapy-themed episode recalls one of the best-written hours of The West Wing). Sorkin still knows how to marshal a writer's room to give him the raw material he needs to write a comprehensible hour crammed with details. By setting the show in the recent past, Sorkin can productively remind or inform a broad audience of the pith of important news we've lived through: specifically, Season One covers an eighteen-month period between April 2010 (the BP Deepwater Horizon disaster) and August 2011 (the debt-ceiling debate). Of course, the game is rigged, usually to make our heroes news savants who resist making the mistakes of the rest of the mainstream news media. Happily, the device illuminates (let's say, by calling the Koch Brothers out of the shadows) more often than it shamelessly obscures issue with emotion (even Frank Capra would know better than to play Coldplay's "Fix You" to accompany breaking news of the shooting of Gabby Giffords). The killing of Osama bin Laden gets an unfortunately patriotic treatment (mitigated slightly by one 9/11-touched soul feeling empty instead of victorious), but Sorkin wins big with a subplot about wiretapping that not only revisits a news story (the News of the World scandal) but gets ahead of the curve on one (NSA wire-tapping that we all just decided to acknowledge, thanks to Edward Snowden). So The Newsroom is a mixed bag, but I don't plan on missing a single episode. Key to the series' survival has been a fine cast, with the top troika of Daniels, Mortimer, and Waterston particularly endearing. Call me an idealist on the order of the show's own characters, but I'm hoping Sorkin will have taken in some of the criticisms and, having gotten some bad ideas out of his system, move on to a more refined Season Two. Something tells me we'll have just as many pratfalls and high-school-locker conversations from this group of "professionals" as we saw in year one, but as long as The Newsroom skews more to witty than goofy (a close call in Season One), it's a show worth watching. Now if it could only be more restrained than sappy (I dunno...bring in Richard Schiff? ), we'd have The Newsroom 2.0. 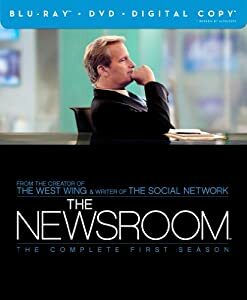 HBO sends The Newsroom onto the shelf in a six-disc Blu-ray + DVD + Digital Copy special edition set. The Newsroom looks and sounds good in hi-def Blu-ray, improving in both departments from even the HD broadcasts on HBO. There's a slightly grainy quality to the show, by design, that keeps the show from playing into the digital sheen of actual cable newscasts and The Newsroom's slick studio sets. The grainy effect is a bit more pronounced in the pilot episode, but all of the ten episodes are well resolved; in short, they look like the broadcast versions, but tighter. Contrast and color are accurate, and detail is pleasing. The DTS-HD Master Audio 5.1 mixes also maximize their source material, though, as expected, this Sorkin series is all about the talk, which comes through clearly and centrally. In keeping with other HBO seasons sets, this one arrives with a number of regular features that come one per episode. In this case, those include the episode's "Previously On," the episode's preview, and an "Inside the Episode" featurette with creator/executive producer Aaron Sorkin (originally broadcast following the episodes). The "Inside the Episode" segments, which run between two and five minutes, offer a nice opportunity to hear Sorkin's thinking in constructing the episode in its character development and themes, dovetailing with a revisit of a news event. Half of the episodes come with audio commentary: Sorkin, executive producer Alan Poul, and co-executive producer/director Greg Mottola on pilot "We Just Decided To"; Sorkin, Jeff Daniels and Sam Waterston on "The 112th Congress"; Sorkin, Poul, and Emily Mortimer on "I'll Try to Fix You"; Daniels, Poul, and Olivia Munn on "Bullies"; and Sorkin, Poul, Daniels, Mortimer, Waterston, Alison Pill, and Thomas Sadoski on "The Gretaer Fool." Though occasionally a bit spotty, these are inordinately interesting commentaries, with fun anecdotes and trivia about the show and whatever else comes to mind for the participants. Deleted scenes come with "We Just Decided To" (1:24, HD), "The 112th Congress" (:43, HD), "The Blackout, Part II" (1:29, HD), and "The Greater Fool," which includes two trims (1:59, HD). "Mission Control" (5:17, HD) examines the production design as it concerns the impressive ACN studio sets. Best of set goes to "Roundtable" (25:30), a group conversation with Sorkin, Poul, Mottola, Daniels, Mortimer, and Waterston about the first season, dealing with real news stories, preparation and production from the writers' and actors' perspectives, and musings on the second season. The cast members seem entirely enamored with Sorkin and the show, and this amounts to something like a video commentary: nicely loose and playful but also informative. Mortimer even spills the beans about a planned-but-postponed kiss between her and Daniels, and gets Sorkin to comment on it. All site content © 2000-2019 Peter Canavese. Page generated at 04/20/2019 04:45:38AM.